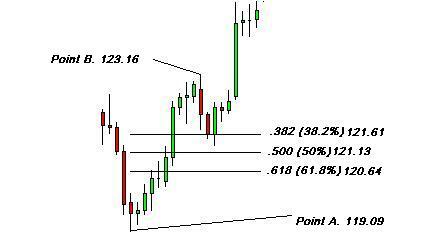 Of all the trading tools I have ever used by far my favorite tool for analysis is Fibonacci studies. This is such a large and complex study that I shall not even pretend to be an expert in this area. Instead I would like to demonstrate how I apply a limited knowledge of the subject to my trading. In the example below you can see a chart of the daily JPY/USD. 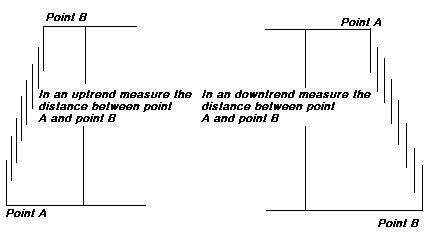 Point A is 119.09 and Point B is 123.16. If you calculate the 38.2% retracement you get 121.61, the 50% retracement is 121.13 and the 61.8% retracement is 120.64. For example. The difference between 119.06 and 123.16 is 4.07. If you calculate 38.2% of 4.07 you get 1.55. If you then take 1.55 from 123.16 (Point B) you get the 38.2% retracement of 121.61. 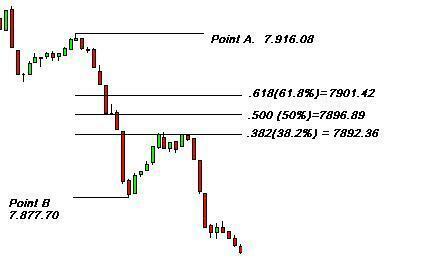 You can use the same principal for the other retracement levels. I apply this technique by first identifying a trend in the market I am following. As soon as I can see that there is going to be a retracement I them calculate my retracement levels. I then enter at the 38.2% retracement level and place my stop loss behind the 61.8% retracement level. If I feel the difference between the 38.2% and 61.8% level is to great a risk I drop down a time frame and use the same technique but get a much tighter stop.